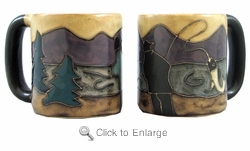 This Mara coffee mug shows a scene of a fisherman with a fish on his line and a background of mountains, pine trees and a lake. A nice gift for a sportsman. You can see all Fish Designs here Fish Designs.